I want to introduce you to the best online retailer ever! I have been working with NA-KD Fashion for a few months now. In between those collaborations I have found myself shopping on their website. I’m hooked! They have the cutest and trendiest items ever. The price point is amazing, as no item is really ever over $75. While I love the affordable price points, they also carry a wide variety of designer brands. The best part – they offer FREE INTERNATIONAL SHIPPING. I mean for that reason alone I choose different retailers over others. This company is based in Sweden so you know they have the best street style stars to collaborate collections with. 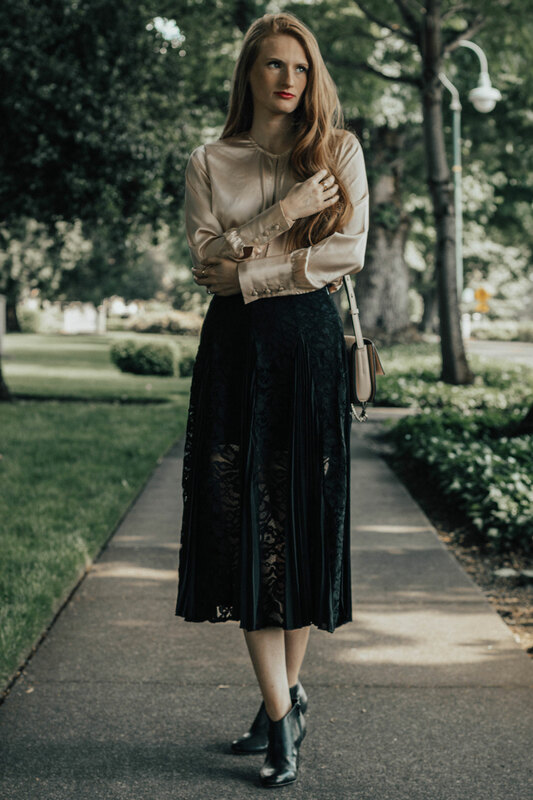 My cream satin blouse and my lace midi skirt are both from NA-KD. Use my code 20aube for 20% off your purchase. I love these two items together because they create such a classy look. 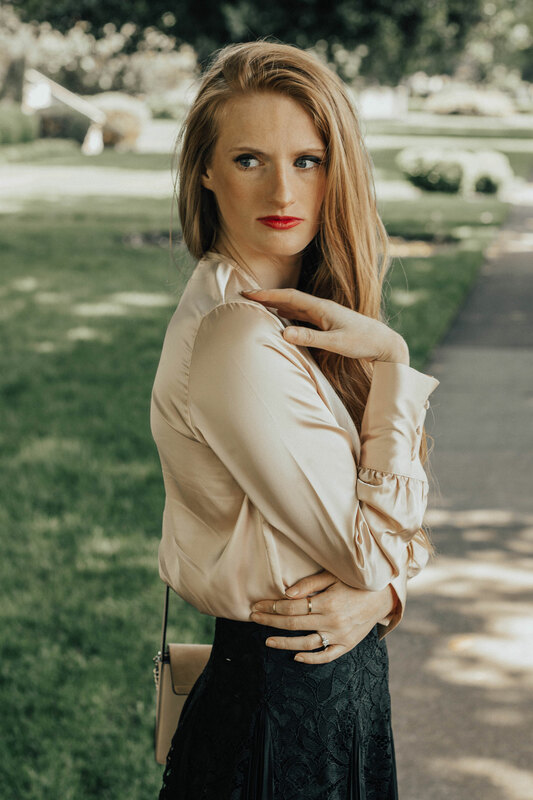 That’s the beauty of this powerhouse retailer – you can buy classy clothes, party clothes, vacation clothes, work clothes, everyday clothes and so on. The cream top also comes in the prettiest pink color. I also can’t wait to wear this skirt during the fall. It is very see-through, so I wore a pair of Spanx underneath! The best part is that each item is unique, the quality is great, and you can walk away with a decent sized shopping cart for under $100. I love sharing deals with you all. In my widget I also selected a few other favorites from the best online retailer NA-KD! girlfriend, you are gorgeous. And this outfit suits you. 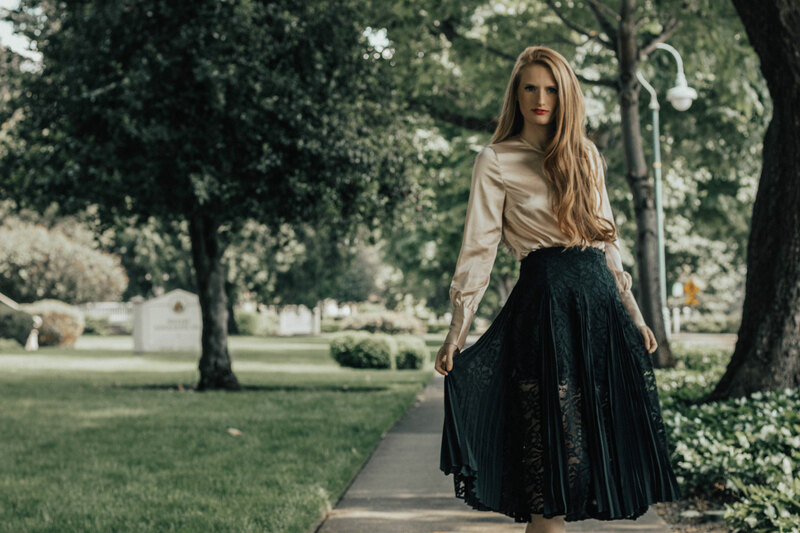 That is one of the prettiest maxi skirts I’ve seen in a while! I am loving it for summer! This skirt is gorgeous!! I love the color and the lace and pleats combo! that skirt is so pretty! I love the detailing! Love your skirt! It’s really pretty and I love how you styled it. 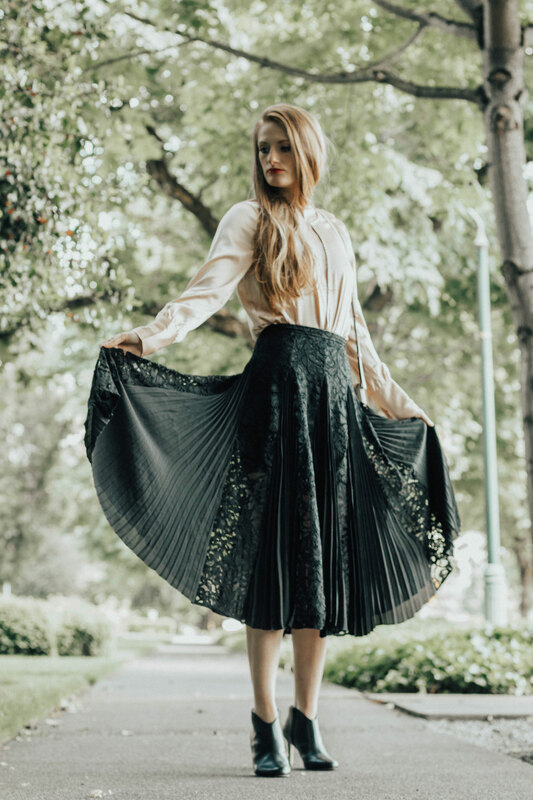 This skirt is such a dream! I love the way you styled it too! Your skirt is gorgeous! Thanks for sharing this store information. I’m always looking for new places to shop at. I’ve never shopped NAKD fashion before but I see it all over now. That skirt is really cute and loved that you paired it with the cream top. That skirt is sooo gorgeous!! Thanks for sharing the site. Will definitely have to check it out. I’m one of those people who can’t put together an outfit to save my life, but I really love all of these things! That skirt is awesome and the shoes are on point! You’re quite the fashionista and should be my personal shopper! Lol! Skirt is absolutely amazing. Love the details. It looks great on you. That skirt is absolutely stunning – such a great statement piece! Thanks for sharing deals with us ! The clothes quality looks great and the price is affordable 🙂 You look really pretty with this cream top. I can totally see why you are hooked! What a lovely brand and an amazing selection of unique items! I would love to go on an online shopping spree right away! They have such a great selection and the quality is so good. I’ve never returned anything I have bought from there. SO GOOD! I love your outfit a lot. The maxi skirt is very stylish. I like it on you. So stunning, I love your choice of outfit. This shirt is everything, the lace is delicate yet fierce at the same time. I’ll so see how I can take advantage of this sale. I can’t get over the skirt. 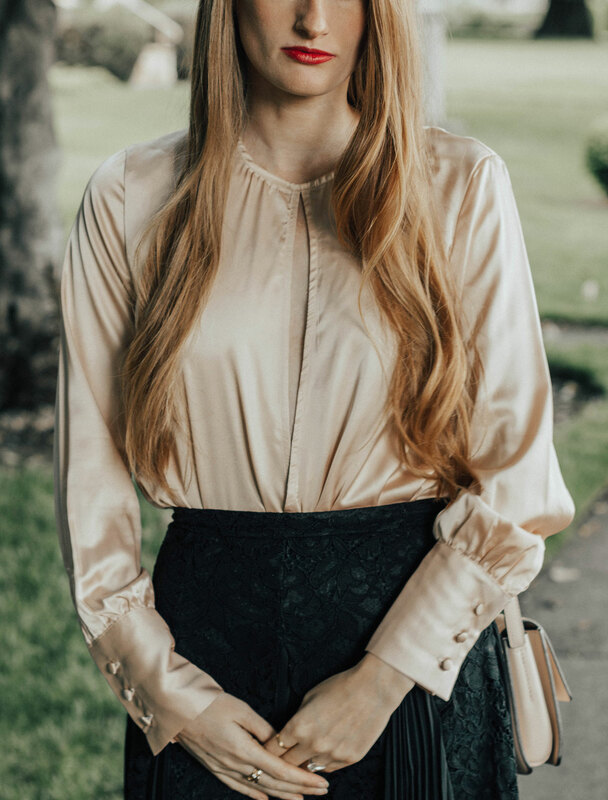 So much lovely details and easily pairs with many tops. Love this look. Especially that silk blouse. So chic! I love how well you styled the individual pieces together. It’s such a classy, sophisticated look! I will be sure to check out the store and purchase an item…or ten. Lol. Great post! Your shoes are gorgeous. The outfit is awesome too. Would check out this site. This skirt is stunning! I love how you styled it! Oh that black skirt! and it is so wonderful to photograph because of the textures. I will check your recommendation. This skirt is so cute! They have great prices!